These days, couples are getting hitched a bit later in life than in years past, and with the rise of second marriages, the average ages of couples tying the knot are skewing higher and higher. As a result, today's couples are a bit more established in their lives and therefore already own a good portion of the traditional registry gifts in their respective homes. So what does a modern couple register for when they already have all the kitchen, bed and bath essentials that make up the majority of a traditional wedding registry? Thanks to the internet, today's couples have some unique wedding registry options to choose from that allow them to register for anything from a honeymoon, adventurous experiences, to cash for a down payment on their first home. Universal registries are on the rise as they allow couples to register for anything from anywhere, whether they've got their eyes on furniture or a sky-diving trip for two. Read on to learn about some awesome registry options for modern couples. 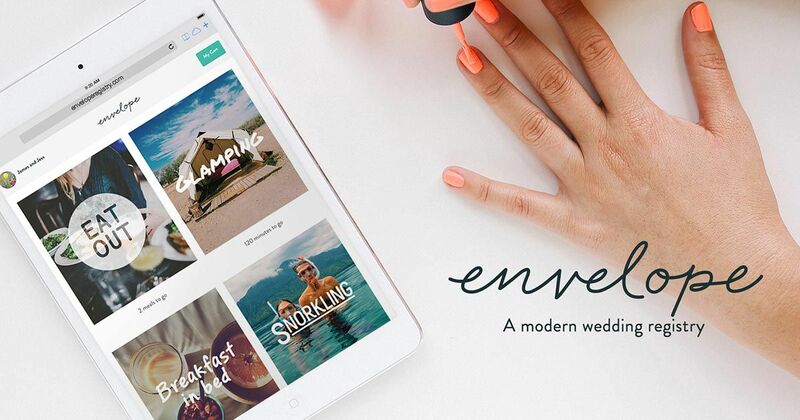 Envelope is a modern take on the traditional wedding registry that offers couples a beautiful and tasteful way to ask for money on their big day. Envelope allows couples to create their registry from a range of items which can include anything from snorkeling to a night at the theater to appliances for their home. Once completed, couples can invite their guests to contribute money directly to the items they've added to their registry. This makes it simple for guests to contribute at their own comfort level, so group giving is totally easy and encouraged. Couples can track their gifts in their account for easy record keeping. To sweeten the deal, Envelope recently launched a thank you card service to accompany their wedding registry. Envelope allows you to type a personal note to each of your guests and choose the card design you love most. Then Envelope will print and hand write your thank you cards and send them to the folks who sent you gifts. Their thank you card service offers the ultimate convenience for today's busy couples. Honeyfund is the #1 wedding crowd-gifting platform and now offers a Universal Wedding Registry Tool. Their platform makes it easy for gifters to give exactly what fits their personality and the personality of the couple who receives their gift! Universal truly means just that -- the couple can add items from anywhere on the web, or even add their own custom registry items like experiences, trips, donations to charity and more. With no fees for registered couples or guests, Honeyfund powers all kinds of experiences and gift registries, offering the ultimate flexibility for couples. Honeyfund has even partnered with many of the top retail stores you may have registered with, including Macy's, Pottery Barn, Target, and more. Honeyfund's platform pulls everything together into one convenient registry to be viewed and shopped by your guests, for the ultimate in convenience. Tendr is a simple and elegant way for a couple to receive cash wedding gifts. Using their gorgeously modern platform, you can easily create a personalized landing page for your wedding and let your loved ones give meaningful cash gifts for you to use as you wish. You won't have to worry about lost checks or finding the perfect card at the last minute ever again. Not only is the platform beautiful but it's incredibly simple to use, and makes the experience of giving cash feel warm and personal rather than cold and tacky. Once they've specified their gift amount, your wedding guests can choose from an assortment of beautiful digital cards, which they can personalize with a note and send instantly with a simple click. Couples are notified whenever they receive gifts and can keep track of each one they receive with the beautiful dashboard in their account. The service is free for guests, and couples just give up 5% of their overall gift amount when they redeem their gifts for cash, directly into their bank account. Tendr makes giving cash simple, efficient, and beautiful!